Paris, Friday 11 July 1760, heading for that special enlightenment salon this evening, but it’s too warm for a complete habit à la française. Why not try the demi-habit this summer and stay cool as the champagne fizzes and the bon mots sizzle? This 1760s man’s coat sold at the Hotel Drouot in Paris in 2010. The fabric is a lightweight striped silk taffeta in shades of green and pastel pink; it has wide lapels and an attached vest. (Some of the buttons for this garment are missing.) The two front sections of the vest are sewn directly to the armholes of the coat, so there is no back to the vest, just the coat itself. According to the auction catalog, this is a rare example of a coat for the summer or the French Colonies. This utilitarian combination allows for a degree of formality while alleviating a least one layer of clothing. Oddly, this appears to be more akin to a formal banyan, if such a creature ever existed, than a day coat. Makes one wonder at the number of novel solutions for comfort and conformity lost to time. 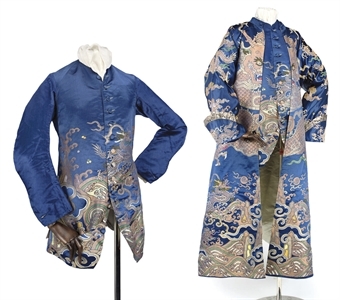 Below, find an example of a banyan created from a blue dragon robe with a matching long sleeved waistcoat, which also straddles the formality line. Finally, another example of a banyan, but more in keeping with the "accepted" idea of the style. 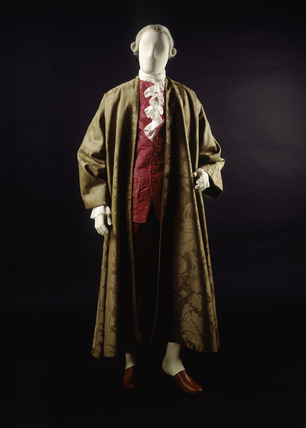 This brown woollen damask garment, c. 1739-41, is from the Museum of London. 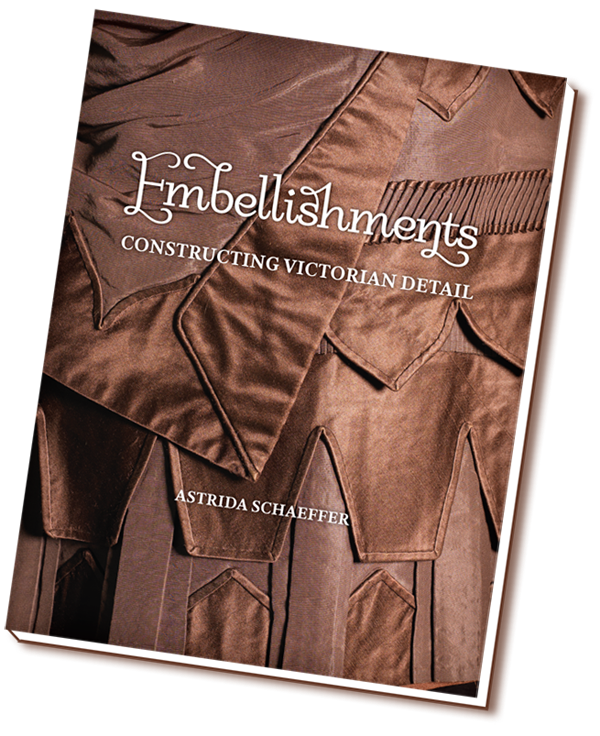 Jeff Hopper writes on men's fashions, past and present for SilkDamask. Previous blog posts may be found on the site. This charming two-piece sailor suit is from the textile collection at the Strawbery Banke Museum in Portsmouth, New Hampshire, USA. The records are currently silent on the provenance of the ensemble, so nothing is currently known about the family or maker or wearer of the simple, but well-crafted shirt and trousers. Nonetheless, it has the ability to conjure up images of New England’s long relationship with the sea and the maritime trade. 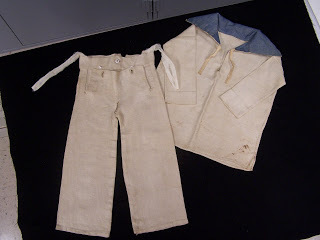 Made of homespun and entirely hand stitched, incredible care went into its planning from the hand stitched blue, denim-like collar to the two milk glass buttons of the drop front trousers. Even the shirt ties are placed with care. 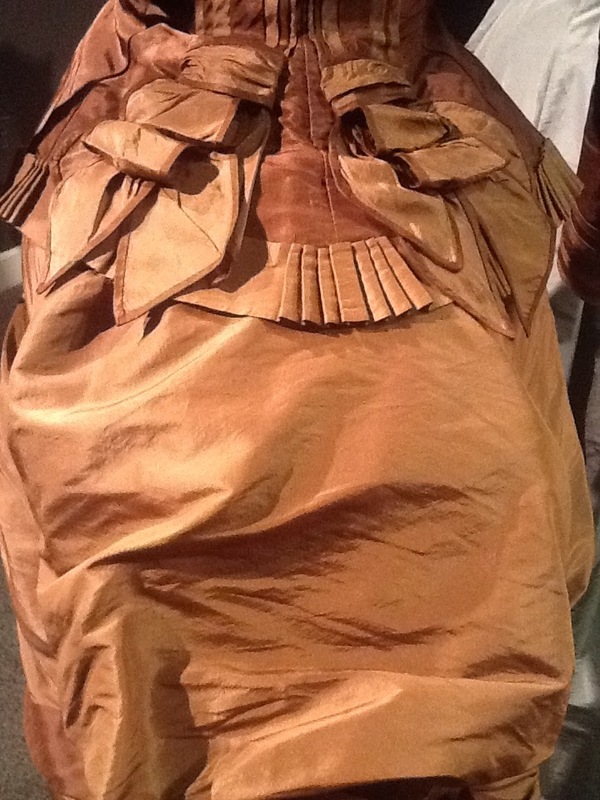 It is dated circa 1840-1850 based on men’s clothing of the time. 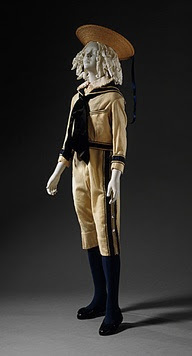 When placed on the mannequin, the little sailor assumes a jaunty, playful air. 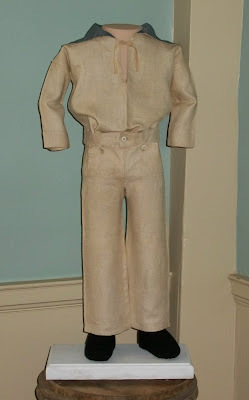 Exhibited:“Through the Eye of the Needle: Family Stories, Sewing Stories” Portsmouth Athenaeum, Winter 2009; "Thread" Strawbery Banke Museum 2012. Jane Radcliffe and Ron Kley of Museum Research Associates (MRA), recently discovered this elegant pair of wedding slippers while conducting ongoing research at the Vaughan Homestead in Hallowell, ME. 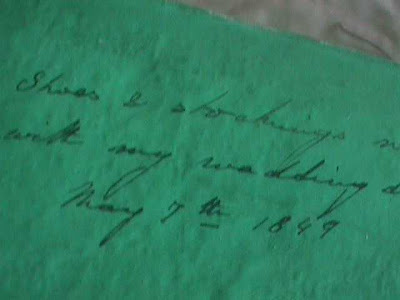 According to MRA, they are part of the May 7th, 1849 wedding outfit of a mid-19th century proper Bostonian -- Mary Eliot Dwight (She married Dr. Samuel Parkman and became the mother of Ellen Twisleton Parkman, who married William Warren Vaughan). http://silkdamask.blogspot.com/2012/09/whats-in-label-3-queen-victorias-1840.html) Similar foot apparel has survived in dozens of historic garment collections. This is not surprising as they are important emblems of significant events. Shoes and other accessories, such as stockings, hats, and gloves were fairly easy to store - much more so than an elaborate wedding dress. Mary Dwight's wedding slippers are of particular interest, however, as key elements of a well documented wedding ensemble. As MRA astutely observe, the charming and diminutive proportions of the (apparently original) pasteboard box in which the shoes were found (and on which their history is inscribed) is as interesting as the shoes themselves. The handwriting on the box notes "Shoes & stockings worn with my wedding dress..."
The slippers feature a square toe, interior kid lining, and dainty silk ribbon set within a channel. I have not seen the sole, but I believe them to be straight last (no right or left). It was not uncommon, even at this late date, to use straight lasts for special occasion shoes. By the mid-19th century, the last Paris shoes could be purchased in any sizable Northeast city. 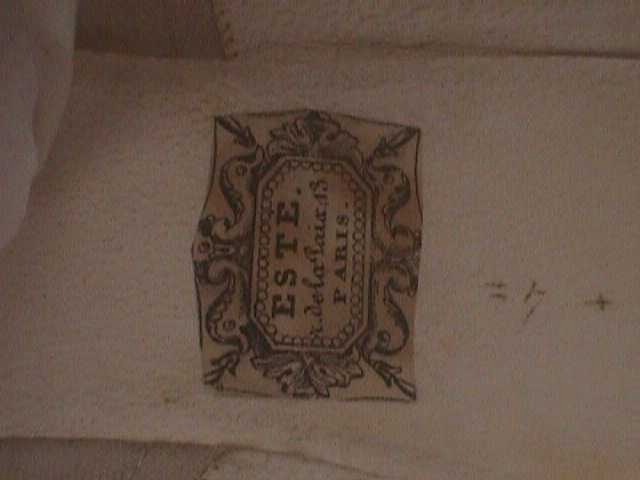 The shoe label is particularly attractive - research is currently underway on the designer. Other lesser known examples are in numerous collections such as these found in the Irma Bowen Collection at the University of New Hampshire. It has no known provenance. The ballet flat or slipper style remains popular to this day as may be seen in the work of designers such as Emma Hope, who got her start designing ballet flats for Laura Ashley. With wedding season upon us, sharing this graceful footwear from the past seems appropriate. The author thanks Museum Research Associates, the Vaughan Homestead Foundation and Astrida Schaeffer, of the Irma Bowen Collection, for generously sharing this images and information on New England footwear.